Designer Con 2017 was two weekends back, November 11 & 12th, at the Pasadena Convention Center. It's a show that's been running for five years now that focuses on designer toys and art and it's gotten such a big following that it'll be moving down to the much larger Anaheim Convention Center next year. Hopefully that won't spoil [ahem] the fun since the Pasadena shows have been allowed to both stay cheap ($15 for the weekend!) and maintain a smaller community vibe. There are very few dealer booths and the majority are artists and small companies working squarely within the Indie and DIY spaces. I always feel a bit guilty as I rarely ever buy any of the cool artist-based one-off type of things, or prints and such, as I am just naturally drawn more to the production-run Indie toys. But, with a handful of small companies present there is always plenty to buy! 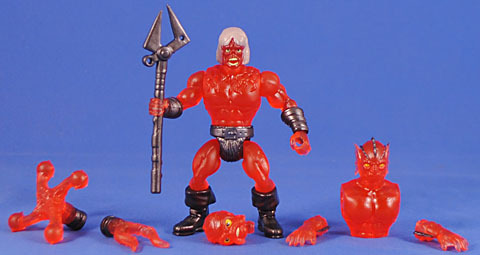 God Beast started off as a major Gylos customizer before joining the ranks of those doing production runs. His main this are these Kabuto Mushis, which are a pretty fun design and he's run them in a bunch of wild colors but this vaguely Egyptian one finally got me to buy in. It's a nice figure with a lot more swivel/Glyos joints than I expected, but I have to confess he suffers the same issues I often have with "regular" Glyos figures in that it's a bit of a pain to line all the different parts up for a consistent look since there are so many swivel joints. The scarab beetle-esque horn on his head is removable and his feet have Glyos pegholes on the other side as well! He surprisingly comes with an alternate head and a little buddy! The minifigure seems like the arms and head are cast separately but they're all glued to the body so there's no articulation. God Beast does some genuinely astounding builds using all these various Glyos parts and I can definitely see some clever design work in this figure. It's pretty fun and I'm pleased to have it. Though Bio-Masters is its own line, but since it launched it seems like God Beast will do some runs in matching colors to his Mushis to allow for some bigger builds - and that's precisely what this is. 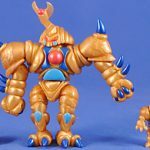 Cast in the same metallic gold plastic with the same blues and red paint this guy is very intentionally meant to combine with the Mushi above, but... honestly I just get overwhelmed with typical Glyos stuff when I try to treat it like Lego and build stuff. That's why I love the Bio-Masters line so much - it's a perfect hybrid of Glyos techno-stuff and action figure-y sculpts. My mind can actually process how to re-combine it! 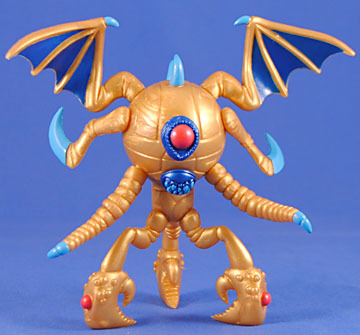 The figure is composed of a bulbous body with a domed "waist" (connected via Glyos peg), the body is covered in Glyos pegholes with the waist has three. We then get three clawed arms (only one of which has a removable claw), three tentacles (two of which have a Glyos joint in the middle), three curved horns/spikes, two wings, two pincer arms, one eye and one mouth. 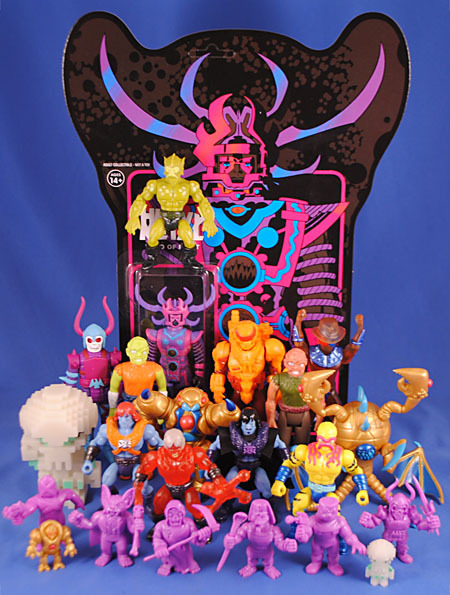 It's a lot and you can do a decent amount of various things with them, especially once you fold in other Glyos stuff. I would like an alternate waist with four pegholes or some extra eyes or something, but over all I really like this figure and can't wait to see where else the line is headed! Bio-Masters had an awesome looking My Pet Monster homage as a show exclusive but it sold out super fast! 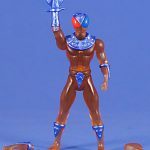 Spy Monkey started a tradition last year of doing MotU homages so with this such-themed DCon exclusive this year is only makes sense that ManOrMonster does the same for their own DCon exclusive - Not-Faker! 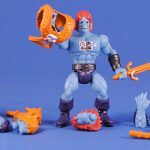 Similar to Spy Monkey's Not-Skeletor this figure uses multiple accessory molds so you end up getting a ton of accessories here, including the full Bog-Nar set, the full Battle Tribes Year 1 set, and the standard barbarian body. 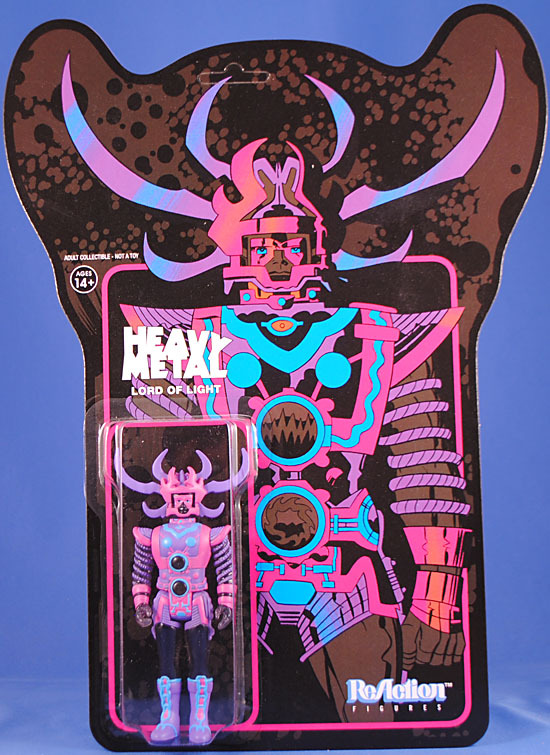 The Battle Tribes stuff get us the torso harness and the Barbarian head in Faker colors to really sell that homage, but the Warlords "Zombie" head has really cool silver highlights which, added to the really cool chest graphic, really sell Faker's android aesthetic! Faker has never been a favorite or a very exciting character/figure to me, but man this homage really nails everything that's fun about the original and these two Glyos-based toylines! 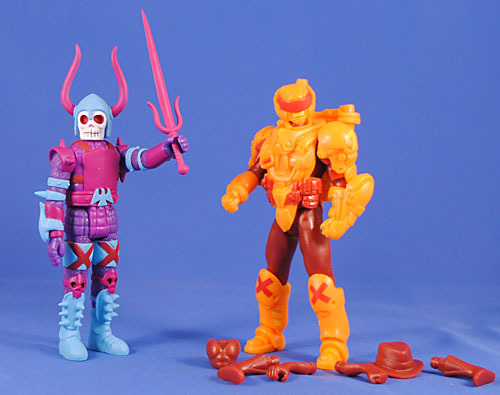 So ManOrMonster started off Warlords of Wor as low-run, hand-cast resin 5.5" figures but earlier this year switched over to using the Battle Tribes buck and Glyos joint system - and they're awesome! 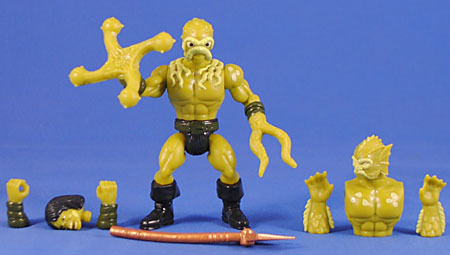 You get the standard BT barbarian body then three heads, a weapon, four hands and a flippin' alternate torso! Now THATS what I'm talking about! This guy comes in the "Orc Green" from BT's first series and has light green painted highlights. It really puts the "bog" in Bog-nar and I quite love it! Oh. My. Bog. This figure is utterly gorgeous!!!! The colors are just wondrously beautiful together - electric yellow, neon pink and metallic blue - and the black tiger stripes do a shocking amount of work to pull this all together. In retrospect I really should have gotten two of this and will definitely be placing an order from the website for another (and some blanks!) because I really love both torsos on this guy! I just... on paper there's no way I should like this color release but in reality it's probably my favorite in the entire Warlords line, and one of the greatest in all of Battle Tribes, too! This is pure, utter toyetic fun!!! Translucent bodies aren't really my jam, nor is a red a particular favorite, but this is a surprisingly striking figure (and a fun throwback to one of the 5.5" Bog-nars, I understand). He comes with a nice, metallic gun metal gray paint on the clothes, etc., which really add a surprising amount of dynamism to this figure! Surprisingly the Onell Designs booth didn't have any Glyos figures (at least that I saw) - just a bunch of these Bit Figs. I don't follow the Glyos scene well enough to really know what's up these days but I gather these are genuine Onell products but being sold as vending machine toys. They done some of these larger figures for the usual consumer base, and when I saw this beautiful hunk of Glow-in-the-Dark plastic I knew it had to be mine! 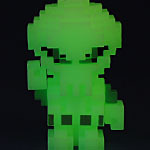 It's essentially an 8-bit inspired, chibi style version of Pheyden, Onell's core Glyos figure/character. The sculpt is nice, fun and pretty tight. His shoulders have Glyos pegs so he technically has two points of articulation. 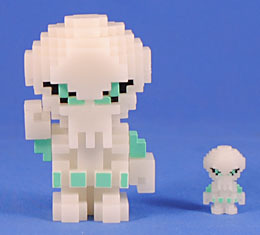 I don't really know what one would do with a "normal" one of these, but as a Glow figure it's just a delight! He even comes packed with the "normal"/vending-machine sized version of the same figure. While it lacks any articulation is does have a Glyos peghole on the underside, so that's kind fun! 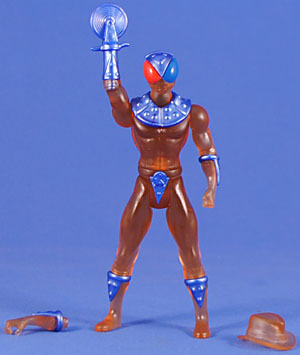 Both had black eyes and turquoise blue highlights, which is the standard look for Glyos Glow-in-the-Dark figures. You know... I never would have guessed it, but I think this is actually my favorite purchase from the whole show - he's just a big, cool hunk of GitD plastic! 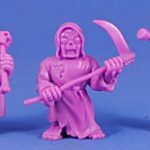 Spy Monkey's exclusive for this years is Not-Skeletor, which is a perfect follow-up to last year's Not-He-Man and Not-Battle Cat! I'm really enjoying the Battle Tribes line and this release is sort of the pinnacle of the line so far as it includes every piece they've yet released! We get the six heads and four weapons from Year 1 and the six heads, wings, weapons and monster feet from Year 2 - plus a cape! And, of course, the standard Barbarian body. Including so much, especially 12 heads, is definitely a bit overwhelming (and kind of highlights how many spare heads we have in our parts box) but I get it - they needed the Barbarian head from Year 1 for Keldor and the skeleton head from Year 2 for Skeletor, and this is just how the tooling is broken out. 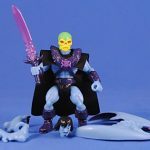 The figure is cast in a nice sky blue color with black, dark purple and dark metallic paint (plus the greens for Skeletor, which would have been nice to see on some of the other heads, too). All in all, it's a really great looking figure and a very welcome addition to both Battle Tribes and the Masters of the Universe sub-theme they been building! The idea of this is so wonderfully brilliant. 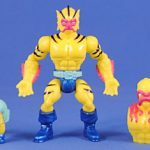 An awesome, untapped Jack Kirby design that makes for a cool figure but then also allows for tons of fun repaints - it's a perfect marriage all of Super7's interests and strengths! This guy first rolled out in sparkly black plastic and gold highlights at SDCC, then a surprise LootCrate exclusive glow in the dark version and now this NYCC "exclusive" black plastic version. The sculpt is quite nice (given the ReAction aesthetic) and painted pretty well in bright pinks, purples and blues that leave what I presume to be exposed skin as glossy black plastic that has a bit of translucency to it, kind of like obsidian. It's a very striking figure! Plus, he comes a big, gorgeous card that I like so much I really can't decide if I'm going to open him or not...! Man, I really hope they keep this figure rolling for a while and do a bunch of fun, wild color combos with him! 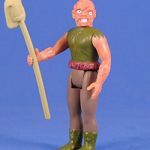 The Toxic Avenger figures must have done remarkably well for Super7 because they've rolled out two more repainted, the first of which is this "movie accurate" one. Much like the original, green-skinned one I got at C2E2 this is a pretty nice sculpt with the standard five points of articulation. Here, he's cast in peach fleshtone plastic and his exposed skin gets a heavy brown wash giving him a surprisingly dynamic look and really brings out the detail in the head sculpt. 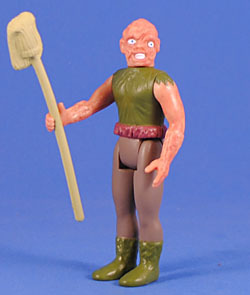 And, of course, he comes with his trusty mop. This one basically negates that first one, but I'm happy to have both as the green one is still neat colors for the character. 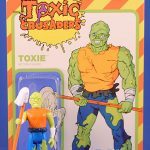 The Toxic Crusaders toyline was a big favorite of mine as a kid so I really wanted that cartoon colors repaint from the initial release but it sold out pretty quick, but now I have an even cooler one! 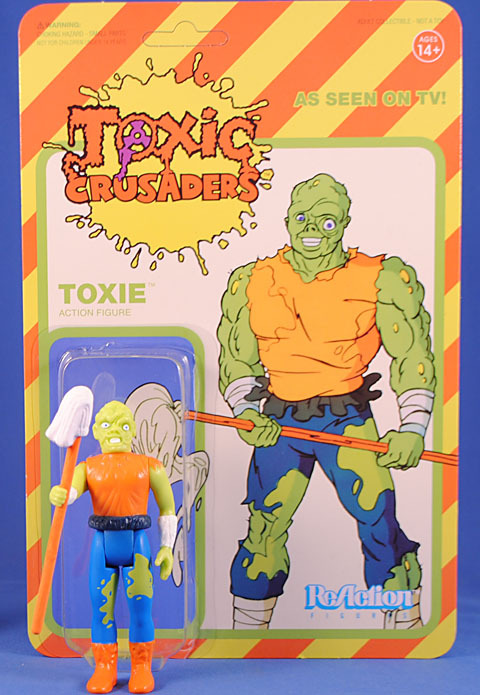 It's the same sculpt as the other Toxie's but now deco'ed in great, vibrant shades of green, blue and orange. This version even has some deco on his leg suggesting holes in his pants. Best of all, though? His card art is straight up art from the cartoon! (the cardback even has an animated style cut-out mask this time, too) Suggesting... Super7 picked up the rights!!! Oh man, those designs are so toyetic and ripe for new figures, so my figures are firmly crossed there are more in the future! Now THESE I can get behind! 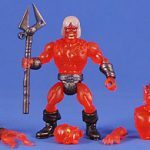 It's awfully expensive to collect a bunch of repaints of a six figure series sold at $15 a piece, but M.U.S.C.L.E.-style 3-packs in solid colors for $6? Oh yeah, all in! 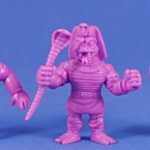 Here we get Snake Tut, Black Falcon, and X-2 (The Unknown) in DesignerCon exclusive Purple. The sculpts are all fantastic, and arguably better than the ReAction versions. Plus, they even get removable accessories! At first I thought it was only X-2, whose gun was packed taped to the side of the blister, but Black Falcon's sai/sword and Snake Tut's cobra staff are also removable! Completing the set, Pack B brings us Batula, Gas Phantom, and the Robot Reaper. Also cast in purple, which is "exclusive" to DesignerCon 2017, which really just means it was first available there and is now easily available via Super7's web store. Just like Pack A, the figure are all wonderful sculpts and in much more dynamic poses than the ReAction figures. Like the other set, there are removable accessories for all three characters! Man, I got these because I liked the IDEA of them but now that I have them in hand, I love them for how well they turned out! These are genuinely great minifgures! You better believe I ordered the NYCC "exclusive" orange sets from their website! 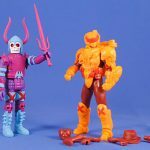 Super7 surprised a lot of us with this reveal for NYCC, packing one of their The Worst figures with a glyos-family figure! So, I was really happy to see that Toy Pizza's booth had some of these and thus get an awesome Worst figure and my first Knights of the Slice figure! The set has a fun "fire and ice" vibe with Worst's Horrid Falcon painted up in gorgeous blues and purples and Fire Fight cast in brick red with neon orange armor. Falcon is one of my favorite Worst figures thanks to fun super 80s style and very detailed sculpt, which the paint really plays up here. This is my first Knights of the Slice figure, and it's pretty nice. It's a clear Power Rangers riff with designed with the standard 5 POA aesthetic, each being a Glyos joint, with additional Gylos/swivel joints at the forearm and calf. The armor is very Glyos in style and includes boots and gloves that replace the hands and feet, a helmet that replaces the head, clip-on shoulder armor and torso armor that fits over the torso and includes a removable backpack and a little collar piece to sort of bridge the armor and the helmet. The figure still includes the standard feet, hands head and fedora hat (implying how the tooling is broken up) which is kinda neat, too. It's a pretty fun set, and quite reasonable at $25! I picked this guy up from them as well since I kinda wanted a "regular" Knight and he is "cola" themed... I love me some soda pop! ...though, I am a devoutly a Coca-Cola man while his eyes and armor imply he's a Pepsi Knight. The figure is a nice, slick sculpt standing about 4" tall. He's got swivel joints at the shoulders, forearms, waist, hips and calves - each of which are Glyos joints, so they're removable and swappable. The head is on a ball and socket joint and the base of the neck swivels as though it were a Glyos peg as well but I can't get it to pop out. The armor is all separately cast and fits into grooves in the sculpt; the arm and leg armor is removable while the crotch piece, collar and head piece seems to be glued in place. They all have a novel pizza them to the sculpt. We also get a fedora hat, for some reason, cast in the translucent brown/orange plastic of the body and an alternate pizza slicer weapon to swap out for his hands (it's too long to work as a peg-leg, unfortunately. All in all, is a nice figure and I get would be pretty fun in the original bright colors. Here, it's novel but not all that exciting. And it's weird that some of the armor isn't removable (and BOY are those some TINY hands), but it's not really a deal breaker. You say you want a He-Man Christmas sweater? 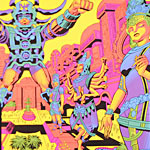 This entry was posted in Rustin's Spoils of the Week and tagged GitD, MotU, ReAction, Skeletor, Toxic Avenger. Bookmark the permalink. Glyos? I like those a lot!!!! I've got my Warlord of Wor order arriving today, and am eagerly awaiting the Battle Tribes release some time next month. I skipped the yellow Gol Warrior this time around, instead getting a bunch of translucent figures (translucent figures are my jam), but I may have to go back and get one now. 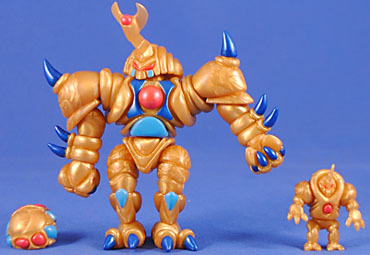 Glyos was fun when it was just Onell with the occasional Callgrim. But more players means more one-night limited sales on top of prices that keep increasing. But the breaking point for me was finding out that item limits were being ignored if you were a friend of the guy running the sale. It's one thing to set a separate supply aside for close friends to purchase from you, but it's unacceptable to claim you're holding customers to an honor system when you're not. As a casual fan of Onell glyos stuff these days, I thought I'd respond to this. First, I don't buy anything, but stuff from Onell's site. I'm just not interested in the expanded offerings and feel no need to catch up on anything else. Secondly, there is no business that doesn't do this kind of thing for friends. 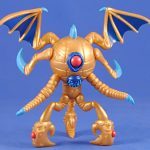 Yes, it can be frustrating for people if they miss out on items, but Onell has never been secretive about their purpose: making cool toys for people to have fun with. It's not their job to make sure people don't have an existential crisis if they miss out on something. I have been buying Glyos here and there for seven years, and I remember where there weren't a lot of limits. Missing out on items was way, way worse than it is now because things were gone in seconds. My gut tells me Onell isn't going to let their friends have such free reign that no one gets their shot. This is all ignoring that Onell is an incredibly kind company to their fans and customers. They always send free things with all their orders, even if it's just a little figure. I hadn't bought in months and hopped on last month's drop, and received about $15 in extra stuff on a $30 order. It's clear you have a bit of a bias, probably because you don't have this particular corner of the hobby in perspective: you will probably never be able to collect it all. I find it very annoying when people dog on Onell and the Glyos community. I've seen yo go re make fun of the whole entire sub culture in one of his reviews, and I just have to ask, why? I'm not the kind of person who gets involved in communities much, mostly because the bigger a group, the more obnoxious they are. Glyos is one of the nicest and most tolerable. Maybe I'm not seeing the bad side of it, but I haven't been as involved in many years. Just have fun with what you can get ahold of and don't act like there is some lack of transparency that lowers their credibility. If you want to open a blister without damaging the card, you can carefully slice around where it turns. You can even just cut 3 sides so you can still display the figure inside when you want.